Stop!! You found it!! The best studio condo at the Royal Kahana based on the view, condition and price. If you've stayed in other studio's at the Royal Kahana it's time you stayed in the best 1204, 12th floor penthouse condo. Incredible Views. 2019 April Through December $140.00/Night. Ask Mike for 2020 dates. Plus Hawaii State Taxes. Cleaning Fee $110.00. $200.00 hold deposit to hold your dates. Final payment due 45 days before arrival. Free WiFi. Free Parking. Air-Conditioned. New Cal King Bed. Heated Pool. We have the best view from our top floor penthouse condo compared to all the other studios, yes ours is the best. All the other studios on the lower floors do not have the view we do, that includes most of the one bedroom condos in the building. If you're going to rent a studio condo at the Royal Kahana this is the one you want. 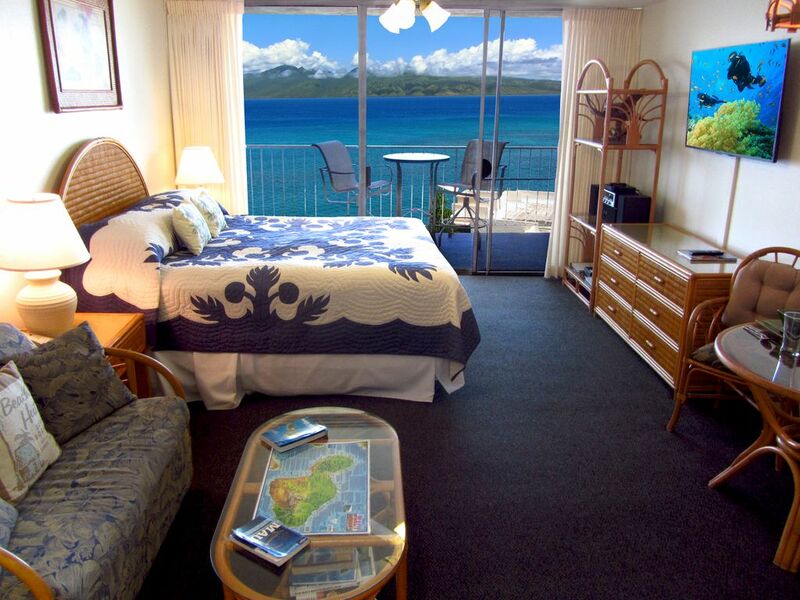 It has incredible views of the ocean and the island of Molokai and don’t forget the sunsets. In the winter from October 10th to March 10th the sun sets in the south so you can’t see it from our condo, our condo looks to the northwest. At that time you can go down to the yard and watch the sunset from there. Our condo has Air-Conditioning, free Wi-Fi, free parking, and there are no resort fees at the Royal Kahana. The condo has been recently renovated. All new granite kitchen fully equipped, the refrigerator has filtered water and a ice maker. New bathroom with a walk in granite shower, bathroom towels and complimentary soaps to get you started. The interior of the condo is decorated in the Hawaiian style. We have a washer and dryer with laundry soap. Iron and Ironing board. A new Firm Cal King bed, bed linens. Pool towels, beach towels, beach chairs, ice cooler and more. The Royal Kahana is an ocean front resort on the Kahana Bay. At this time we don't have access to the shoreline and the beach in front of the Royal Kahana. Access to the shoreline and the beach in front of the Resort can be limited at times from the sand washing out due to king tides and winter storms. We normally have access to the shoreline and a small beach in late spring the summer and in some of the fall months, every year is different. I cannot promise you there will be beach when you get their so If needed you can access the beach at the other end of the Kahana Bay by using the public access just a short walk down the sidewalk two resorts. The Royal Kahana has a heated pool with lounge chairs around it and lounge chairs on the grass around the front of the resort right next to the shoreline for sunbathing or watching the beautiful sunsets. Also you can use the Exercise Room the Ping-Pong Table and the Shuffleboard Court. We also have five barbecue grills on property for you to use. In the lobby is a concierge desk for you to book your island activities and rent snorkel gear. The Royal Kahana has security on property. Across the street in the Kahana Gateway Shopping Center is Hawaiian Village Coffee, Maui Brewing and Restaurant, McDonald’s, Maui Dive Shop, Whalers General Store, First Hawaiian Bank and ATM, Smile Nail Salon and Massage. More restaurants and bars in the area you can walk to are, China Boat, Dollie's Pub & Cafe, Miso Phat Sushi, The Beach House. Check-in is at 3:00pm and Check-out is at 11:00am. If you need a early check in or a late check out please book an extra night to cover it, check in is 3:00pm and check out is 11:00am. No smoking. No E Cigarettes. No surfboards. No bicycles allowed in the condo or on the lanai. No pets allowed. No babies or children. No house parties. No smoking in the condo or on the lanai. Smoking area is provided in front of the resort, ask front desk for location. Also read our complete listing below for all the information about our condo. We have owned our condo since 2006 and have been renting it on VRBO.com since 2011. Why the Owner Chose Kahana. The Unique Benefits at this Condo. Aloha and thank you for visiting our condo listing. We are two brothers who live in Ventura, California. We like to get away from it all from time to time and Maui is where we go. We have owned unit 1204 at the Royal Kahana Resort since 2006. 1204 is the best studio condo compared to all the other studios based on it's location in the building and the view from the unit. If you've stayed in one of the other studios at the Royal Kahana before, now it's time to stay in the best and 1204 is it. We welcome you to stay in our Maui home and relax in our little piece of paradise. The Royal Kahana Resort is located on the beautiful West Coast of Maui in the town of Kahana and is surrounded by Maui's spectacular natural beauty and is located right on the Kahana Bay. The Royal Kahana Resort has a lot to offer you. Swim in the heated pool and sun yourself on the spacious pool side deck or on the lawn near the ocean in our lounge chairs. There are 5 gas-fired barbecue grills just outside the pool area. There is a fitness room, ping-pong and shuffleboard. No resort fee's. Free wifi. Free parking, you can park underground or at ground level. The Royal Kahana Resort has 3 elevators. A Concierge Desk is in the lobby for booking your activities. Just a 5-minute drive to Kaanapali or Kapalua, and just a 10-minute drive (if that) to the historic whaling town of Lahaina. Lahaina, Kaanapali and Kapalua have some of the best shopping, restaurants and don’t forget the Golf on the island of Maui. Besides the view from our unit, the amenities at the Royal Kahana and the location on the West side of Maui we have The Kahana Gateway Shopping Center right across the street. No need to get in to your car and drive to Lahaina or Kaanapali for shopping, the super market or for a nice dinner, just walk across the street up in to the Kahana Gateway Shopping Center, where you can have a bite to eat at Maui Brewing Company American & Island Style Cuisine Microbrewery or for a quick bite there's a Mc Donald’s. Get a gourmet cup of Coffee from Hawaiian Village Coffee House. There is a Whalers General Store and Gas Station, Smile Nail Salon & Massage, Maui Dive Shop to rent you'r snorkel equipment, a Bank of Hawaii with an ATM. We are fortunate to have the Kahana Gateway Shopping Center right across the street. That's why I think the town of Kahana and the Royal Kahana Resort is one of the best places to stay on Maui. Do yourself a favor don’t get caught up in the crowds and the high prices in Lahaina, Kaanapali and Kapalua come stay at the Royal Kahana Resort in the town of Kahana and take a deep breath slow down and relax in the Hawaiian life style. In condo with fabric softener sheet. Bathroom towels. Two Pool and Two Beach Towels. Kitchen towels. All provided. With filtered water and ice maker. Maui Revealed. Maui Hiking Trails. Lawn with lounge chairs next to shoreline. Two beach towels. Two beach chairs and an ice cooler. Very nice and centralized location. This condo is very nice and has a beautiful view of the beach and the sunset (along with numerous whale sightings) from the lanai. It is exactly as advertised and a great bargain! We had a fabulous time here. You can't beat the view for whale and turtle watching! Every morning and evening was spent on the balcony. The bed is comfy. Parking is easy. It was clean and comfy. We will definitely be back! You won't regret staying here! Mornings of watching whales from the lanai. Afternoons watching dynamic clouds drifting by and sensational sunsets. Evenings watching the shimmer of moonlight on the ocean. Slip off to sleep listening to the sound of waves lulling you while in dreamland. And of course, there is the rest of Maui to experience. Best time; the Maui Ocean Center and Pacific Whale Foundation excursion. My husband and I just got back a few days ago from Maui and Mike's place. We are actually wishing we were there right now. We loved 1204! It was absolutely perfect for our vacation. Everything was exactly as everyone mentioned in other reviews and what Mike has listed. We had binoculers as mentioned, to watch whales. We sat out there and watched many whales, it was endless! It was so nice to have a washer and dryer to use as well. We were grateful to have a fridge, stove and microwave. Although we did enjoy eating out it was nice to run to Costco when we flew in so we had plenty of food to eat if we decided to stay in or have breakfast before we left for the fun excursions we planned. The folks at the condo were helpful to set up our excursions. They also provided free snorkel gear. The Miso Phat Sushi close to the condo was delish but it was not cheap at dinner time. The pizza place in the same building was good too. Just don't order too much. Very filling! The Maui Brewing Co had really good food as well. Those were all close to the condo, walking distance. We did go the other side of the island and ate at a local place called 808 Main. We loved the Farmer's Market as well. It is in the tunnel of the trees. I'm not so good at explaining where it all is but that's the fun part, the discovery. I rode horse at the Mendes Ranch while my husband golfed at Maui Nui. They were not close to one another but I was not worried as I had GPS on my phone. We also did a Zipline at the North Shore. We did the road to Hana on a tour bus and so glad we did as we both could enjoy the scenery. We went on a snorkel and whale watch excursion, it was ok. We saw more whales on the lanai at the condo. The other thing we did was a luau and would suggest to find a different one than the one we did. Food was ok, the entrainment was good, but I'm guessing there are better ones. Do some research. Lastly, we did not get to do the sunrise on the mountain as you needed reservations, so set that up way in advance, weeks before you leave, we were told. Just get out and enjoy this beautiful island and when you are not out and about, you'll enjoy 1204. Thank you, Mike! We just returned from our vacation in Maui and our accommodations were exactly as described. The condo was roomy, clean and well appointed. What you see in the property description, the balcony looking out onto the ocean, is exactly what you get. Mike was attentive to our needs from our first inquiry all the way through our departure and online follow-up. We would definitely stay at the Royal Kahana, #1204, again. $200.00 hold deposit due at booking to hold your dates. Final payment due 45 days before arrival. Cancellation policy: If cancelled 60 days or more before the scheduled arrival day the hold deposit will be refunded. If cancelled between 59 to 45 days before scheduled arrival day no refund of the hold deposit. If cancelled between 44 to 30 days before scheduled arrival day you will get 50% of your rental payment refunded but no refund of the hold deposit. If cancelled 29 days or less to the scheduled arrival day there will be no refunds unless we re-book your dates but no refund of hold deposit. If you cancel we will refund the cleaning fee and the damage deposit. Beside the cancelation policy there will be no refunds for weather cancelations or any other reason, purchase insurance especially during hurricane season. Check-in is at 3:00pm and Check-out is at 11:00am. No smoking. No E Cigarettes. No surfboards. No bicycles allowed in the condo or on the lanai. No pets allowed. No babies or children. No house parties.